The container ecosystem has become a very crowded space. Increasing rates of container adoption and usage in production means that the management and orchestration space is just that much more important. And any obstacles or complexities to using containers are magnified when thinking about their use in the enterprise. 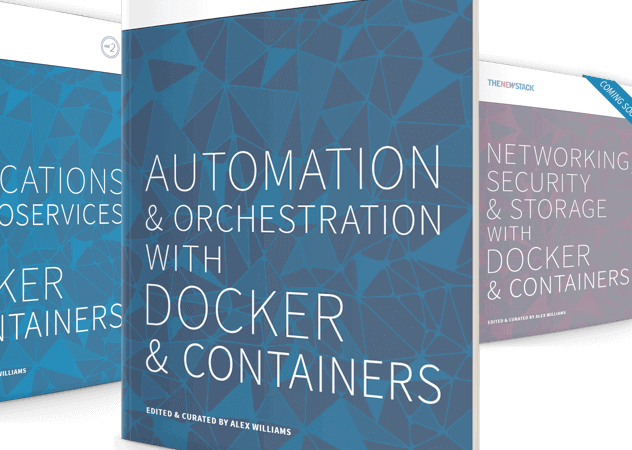 To help bring some much-needed clarity to this space, The New Stack has assembled an eBook, “Automation & Orchestration With Docker & Containers,” which we released today. Download it here. In this ebook, The New Stack explores the ways that vendors and practitioners are automating, orchestrating, and managing their container technologies in multiple environments. We take a closer look at comparisons of major orchestration tools, including orchestration platforms and containers as a service, and how orchestrating containers is a critical component for advancing a wider usage pattern for containers. We illustrate the basic components that go into orchestrating containers and touch on how orchestration involves a wide array of different functionalities including cluster management, scheduling, service discovery, provisioning, configuration management, and even beyond into the role of infrastructure and platforms. We discuss how this space compares to virtual machine management, and how many of the same concepts apply within the realms of software delivery, networking, storage and management. Another major focus of the ebook is on original research we’ve performed surrounding the practices and perceptions of end users and vendors. We created a customized automation and orchestration survey that looked primarily to measure the expectations of our audience about the functionality of orchestration tools; we also asked respondents to report their current and projected usage of tools, the level of container adoption, usage of container technologies in production environments, and more. The resulting data paints a very interesting picture of the current market for orchestration tools and services, and we look to build upon and analyze this data even more in the coming months. This is our third ebook in the Docker and Container Ecosystem series, and the middle of the pack in our total of five ebooks. Since the next ebook is going to address more around networking, storage and security, it was important to establish the goals of orchestration and management in this book. The primary concepts around container management are prevalent throughout the rest of the book series, and this ebook provides a necessary foundation for understanding the choices users will need to make about their technology and practices. This book represented an enormous challenge for us in some ways because the orchestration space is very heated — perhaps one of the most contested spaces in the container ecosystem right now. At the same time, it intersects many different tools and service categories and represents a bountiful area for open source software. Orchestration itself involves so many types of behaviors and practices, that it’s no wonder vendors are so eager to address this space and capture the attention of Dev and Ops alike. As I’ve said before, we’re constantly looking for new topics in need of greater focus and education, and we welcome any feedback on what areas we should tackle next, even beyond the container ecosystem. Thanks so much for your interest in our ebook series. Please reach out to our team any time with feedback, thoughts, and ideas for the future.